(NaturalNews) Without a doubt, the latest breast health guidelines from the American Cancer Society (ACS) — which focus primarily on women of average breast cancer risk — has many people scratching their heads in confusion. The long-held recommendation that a woman should get mammograms beginning at age 40 has essentially been ditched by the non-profit organization which now says that women should begin the preventive exams at the age of 45. And, if that's not enough to confuse and even anger many people, ACS also suggests that once a woman reaches the age of 55, they should only get one mammogram every two years. The ACS also advises against manual breast exams (regardless of a woman's age), whether conducted by a doctor during an in-office visit or done in the privacy of one's own home as a self-check exam. Additionally, these new guidelines come close to the 2009 U.S. Preventive Services Task Force recommendation — which caused a great deal of controversy — stating that women don't need to get a mammogram until they are 50 and then one every other year thereafter. Although the ACS maintains that women should still have the option to begin breast cancer screening at age 40, and that they should still be able to choose to get one annually after 55, the news has sent shockwaves throughout the world. Why the abrupt change? What will they suggest two years from now, or maybe in a few months? Not to fret, says ACS. The organization says that much of what prompted the change involves statistics and the discovery of new information. For example, researchers found that during a 10-year time frame of receiving mammograms yearly, women have had a 50-50 chance of being called back for additional testing — at least once — that ultimately generates non-cancerous results. Such eye-opening developments, which are expected as new studies continue and various findings emerge, spurred the updated guidelines. According to the Society's Chief Cancer Control Officer, Dr. Richard C. Wender, MD, the move was a logical one. "Since we last wrote a breast cancer screening guideline," he explains, "there have been the publication of quite a number of new studies that inform us about the benefits and drawbacks of screening with mammography, so the American Cancer Society commissioned a detailed evidence review by an external expert group to review all of this new data which was then presented to our American Cancer Society guideline committee." He then goes on to say that after taking all the information into consideration and weighing all the benefits and risks, the new guidelines came to fruition. "Since the last ACS breast cancer screening update for average-risk women was published in 2003, new evidence has accumulated from long-term follow-up of the randomized controlled trials (RCTs) and observational studies of organized, population-based screening (service screening) programs." Although several people are perplexed at the updated set of guidelines, saying that mammograms are essential life-saving tools that have played a role in their own breast health or that of a loved one, the change doesn't necessarily deserve such a lukewarm reception. Natural News has long written about how mammograms tend to produce more problems than benefits. In addition to the danger of radiation exposure, when breasts are squeezed during a mammogram, blood vessels can be ruptured, facilitating the spread of cancer to other parts of the body and ultimately, lead to a patient's death. Furthermore, experts have conducted studies demonstrating mammogram inaccuracies involving false positives. That, of course, leads to emotional and financial upsets as patients worry and undergo invasive biopsies. 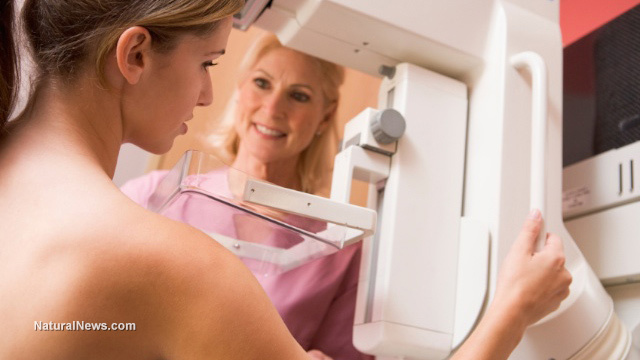 By the way, it's been found that 70 to 80 percent of all positive mammograms don't indicate cancer after a biopsy. The bottom line here — as is the case with most things in life — is to personally assess the information yourself and do what you feel is right for your health. If you're a woman who is deemed to be at an average risk for breast cancer or who does not have a serious family history of the disease, perhaps these guidelines are worth adhering to. It's also news to many people's ears, as it means less radiation exposure and less time spent in what could be needless worry and testing. If you have breast health concerns and a family history of cancer, though, it's understandable that you'd be more inclined to go against these guidelines.